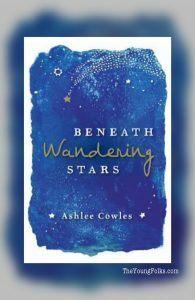 Until reading “Beneath Wandering Stars” by Ashlee Cowles, I had no idea who an army brat was. I didn’t know what their lifestyle was like and I didn’t understand why they were so different from the general population. Even though I still don’t completely understand the situations army brats have to deal with on a day-to-day basis, Ashlee Cowles’ novel opened my eyes to some of the perks, horrors and emotional pain that an average army brat is forced to deal with. “Beneath Wandering Stars” focuses on a young girl named Gaby, an army brat who finds herself on a pilgrimage to a place called Camino de Santiago with an unlikely ally. She’s determined to make this spiritual walk because it was her brother’s last wish before he fell into a fatal coma. Through rain storms, the scorching sun, and occasionally annoying travelers, Gaby pushes on, hoping that by the time she and her foe reach their destination, her brother will wake up from his coma. From the start of the novel Gaby is portrayed as this young, kind of hot head girl who is determined to always get her way. I despised this behaviour and nearly stopped reading the book because I couldn’t stand the main character’s attitude. However, as Gaby begins the walk with Seth, her brother’s best friend, her whole demeanour changes. As they venture across one of the most spiritual destinations in Spain, the author develops Gaby’s character into the kind of protagonist that I can stand to read about but not one that I can relate to. While making this journey, Gaby begins to realize that being an army brat isn’t as bad as she once thought it was. She’s always believed that being an army brat has restricted her from leading a normal teenage life and has looked forward to the day that she could hand over her ID and leave the base. By the end of the novel, the trip has changed her in such a way that she begins to realize that there are some things about being an army brat that she truly loves. She also begins to see the people in her life for who they are. She’s more aware of the reasons her brother and Seth joined the army, she’s able to see Brent (her Rockstar boyfriend) for the narcissist that he is and she slowly understands her family a bit more. I think what I loved most about this novel is the scenery and the other pilgrims Gaby and Seth meet along the way. Normally, I hate when an author goes on and on about the environment their characters are in but this book was different. The way the author described the surroundings didn’t bore me. She compares the scenery to things I can actually visualize and each place that the duo comes across has some significance to the long hike they’re trekking. I feel like I took the walk with them and was able to visualize what the Camino looked like. From ancient churches that housed youths at nights to graveyard porches with a killer view of the sky, I loved reading about all the scenes that these two young travellers come across. Still, the best part of “Beneath Wandering Stars” is the other people Seth and Gaby meet along the way. They come across hippies, a crying pregnant woman with an agenda, rude and close-minded Americans, crazy shop owners who are too accommodating and a priest who feels the need to impart knowledge on youths that seek refuge in an ancient church. The side characters in the novel are all so interesting that I constantly looked forward to Gaby and Seth meeting with other pilgrims. While the side characters can be said to be one of the best parts of this novel, I also loved the way the book was written. The dialogue was so realistic and inspiring that I made sure to bookmark the parts that left an impact on me. Overall, I think that “Beneath Wandering Stars” is the kind of novel that exposes the type of life army brats lead and stresses the importance of the journey rather than the destination.